I know most people look at harvest as the end of the season, but I also like to look at it as the beginning of the next one. Often, what you do in the Fall sets the stage for the future. Mudding through fields with a combine and auger cart – or even working ground when it is too wet – can create damage that will show up for decades in your imagery. Another big culprit is the “striping” of your fields due to the uneven distribution of residue from your combine. This is very common now since most combines cannot spread soybean residue uniformly over the full width of the heads. When you couple this with auto-steering technology that puts you back into the same swath year after year, you should be able to see an emerging problem. This can be avoided by simply moving over half the width of the head every other year, so pass the word on to your combine driver. 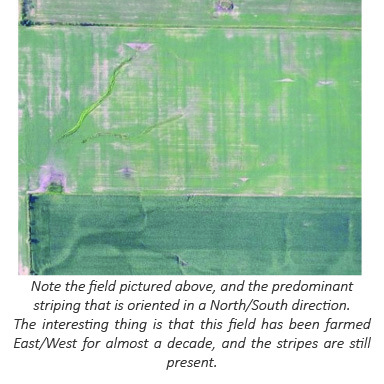 Nearly every field I see from the air has a striping problem – and we as farmers need to own up to this! It’s now our responsibility to identify why this happened and formulate a remedy. Look closely at your visual images both before and after harvest. Whatever striping you left behind, you should expect to see again next year. Another great benefit of your late season imagery is creating a harvest priority strategy. Start by looking at your thermal and visual pictures for signs of downed corn. The hottest areas are generally the ones that died first, so they will normally have the weakest stalks. If everything is standing well, look at the relative temperature of your fields to the surrounding fields. The hottest fields are the driest, and the coldest are the wettest. If you are unsure where to get started with harvest, go to the coldest spot in your warmest field. If it is suitable to harvest there, the rest of the field will be even better. The red areas in the thermal are places in the field that died the earliest. Since this is normally due to a combination of drought, disease, or pests, these areas tend to have the weakest stalks. One of the great features of having year-long aerial imagery is the way we build you a storybook for the entire season. As with any good story, this requires a good ending. 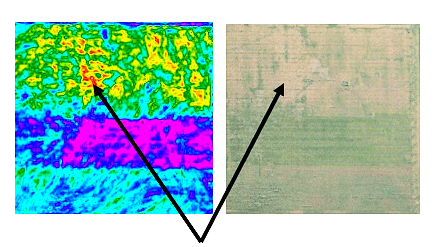 The final chapter of this imagery story needs to end with your yield map. Since I realize that many of us have difficulty getting those fancy maps generated by the yield monitor back out of the little black box in our combines, I added a special feature to our App to make this easy. 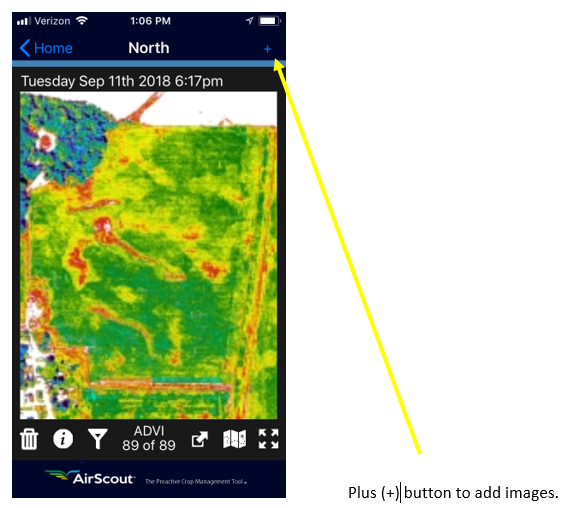 After you’ve harvested a field, simply take out your phone or iPad and snap a picture of your yield map while still sitting in your combine cab. In the AirScout App, navigate to that field. You should be able to see a little “+” sign in the upper right corner. Click on that “+” sign and it will let you import that picture from your library. It’s that simple! If you can take a picture of your dog or your grandkids, you can do this. You can also import pictures of your soil maps (or anything else of interest) by grabbing a snapshot. Our map feature even allows you to align it to Google Earth if you want to navigate to certain places in the field using that picture. Hopefully this message has once again been helpful, and as always, please feel free to contact us if you have any questions. I will be entering harvest season here myself very soon, and I know things are going to get extra busy for all of us, so it might take me a little longer to get back with you for the next AirScout update. I look forward to staying in touch and sharing our plans for new features in 2019.